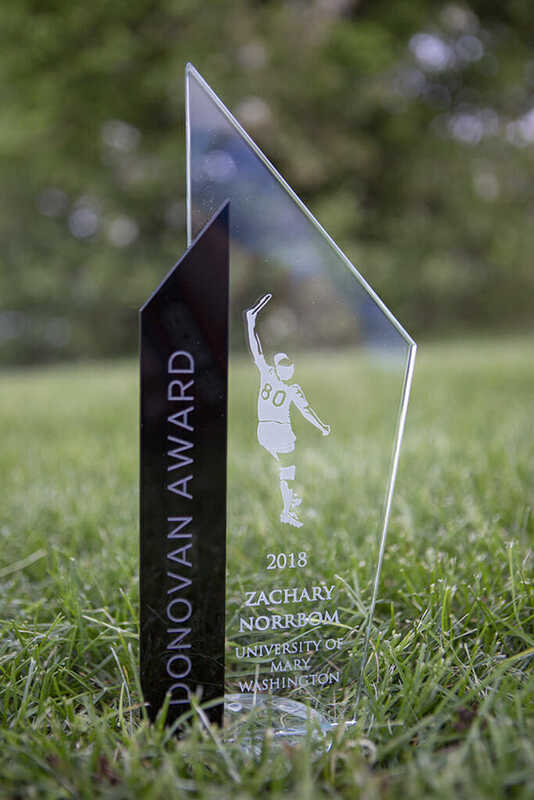 The 2018 Donovan Award in the Men’s Division, presented by the National Ultimate Training Camp, goes to Mary Washington Mother of George fifth-year Zachary Norrbom. Norrbom transformed the program at Mary Washington and led them to their first ever Nationals appearance in 2018. A strong youth player at the high school and YCC level, Norrbom had an immediate impact when he arrived on Mary Washington’s campus, and his work ethic and infectious joy for the game have shaped the culture on Mother of George. He has had a highly decorated career, even before winning the Donovan Award. He was All-Freshman in 2014 and 1st Team All-Region selection in 2015, 2016, and 2017. 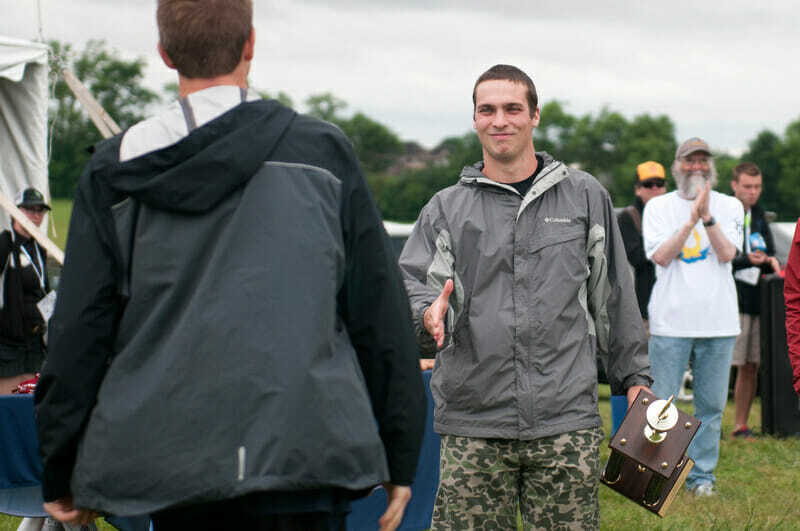 He won a YCC U-19 Mixed National Championship with BUDA in 2013, and he was invited to tryout for the U24 Worlds team in 2017. From the moment he joined the team his freshman year, Norrbom began making his presence felt both on and off the field. His ability on the field was apparent right away, with five years of high school experience giving him a significant leg up on the average college freshman. Off the field, Norrbom began helping to shape the identity of a program that was going through a rebranding after being suspended by the university. Norrbom is also a true advocate for Spirit of the Game. At 2016 Club Nationals, Ambiguous Grey rewarded their individual Spirit Award to Norrbom. Anybody who’s played against him and Mary Washington has experienced his leadership in this regard; Norrbom leads by example with how he carries himself and interacts with opponents, and he holds his teammates to this same standard. Norrbom’s leadership on the field is seen just as much as it’s heard. A vocal presence at all times, Norrbom can be heard calling sets and communicating tactics on the field and barking instructions to his teammates when he’s on the sidelines. Many teams have that one player who is always loud, but Norrbom is constantly loud in a way that is constructive and inspiring. On top of all of this, Norrbom is also an exceptional ultimate player. He’s a coach’s dream in the handler position, capable of winning with his arm or his legs. Norrbom uses the fact that he’s a lefty to his advantage, using his backhand in windy conditions to make throws with which right handed players struggle. His array of break throws means that he can hit almost any cutter at any spot on the field, regardless of force, and Mary Washington has built a successful offense predicated on that skill. Last year, Mary Washington lost in the game-to-go at Regionals. Norrbom had already committed to a fifth year prior to the loss, but falling short of Nationals in 2017 fueled Norrbom and Mary Washington in their quest to qualify for Rockford in 2018. Not only did they qualify, but under Norrbom’s leadership, Mother of George made it all the way to the quarterfinals. Between the growth of Mary Washington under his leadership off the field and his high level of play on the field, Zach Norrbom has shown that he has the qualities desired of a recipient of the Donovan Award. 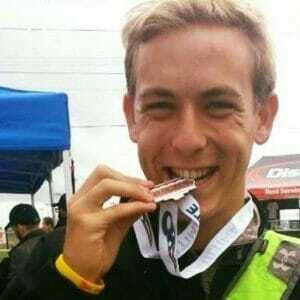 Comments on "2018 Donovan Award Winner: Mary Washington’s Zachary Norrbom"